These crunchy chocolate filled wontons are easily the most lovable dessert recipe. Ready in less than 20 minutes,these wontons can increase the taste quotient of any dinner table.I first had them in a local chinese restaurant.Their taste made me crave for more and that led to making these wontons at home.I am sure this fast and fuss free recipe will win your hearts too. Lay out five wonton wrappers on work surface at a time.Now place 1/2 tsp of chocolate in the centre of top half of each wonton,keeping chocolate about 1/2 inch from edge. Lightly brush all four edges of wrapper with water.Now lift up lower edge to touch top edge forming a triangle.Seal well removing all air from pocket. Take oil in a thick bottomed pan.Heat on medium flame.Carefully place five wontons one after another in oil.Fry till they are light golden brown.Take the wontons out of oil and on kitchen paper towels.Repeat this for remaining wontons. 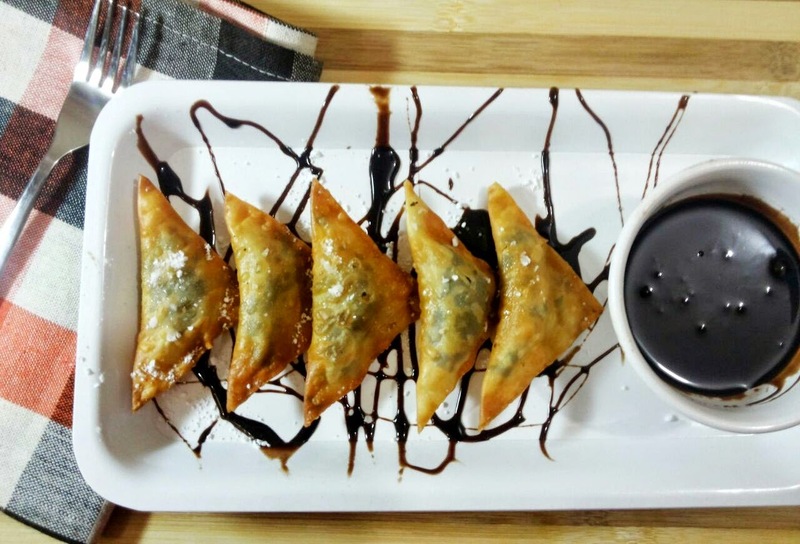 Sift icing sugar on wontons and serve with readymade chocolate syrup or with vanilla ice cream.